..I am very interested in working with intellectual property rights and the benefits of protecting organisation material interests..
Having undertaken a work placement at EnvirUP as part of his course, LLB (Hons) Law (Sandwich), Ibnul Mian wants to share his experience of what it was like to gain work experience, the experience of applying for the job and what studying at NTU has been like for him. I chose to take a work placement with EnvirUP as they specialise in intellectual property and were looking for a legal assistant to organise and file new patents. This was a good opportunity for me as I am very interested in working with intellectual property rights and the benefits of protecting organisation material interests such as innovative products and designs. This allows the organisation to innovate freely without fear of another organisation mimicking their designs for their own gain. As EnvirUP were a medium sized company I knew that my contributions would go a long way and would help them to develop into a larger company and brand. I worked as a legal assistant in the intellectual property department, gaining experience with different international legislation regarding patents, trademarks and registration designs. I filed a number of application forms for patents and trademarks in the EU, USA and Australia and put together evidence for court cases regarding intellectual property infringement of our products. I even had the opportunity to write draft contracts and terms and conditions. The aspect I enjoyed the most was filing patents and trademarks in countries all over the world. Once they were accepted it meant that EnvirUP’s products would be officially registered property and other companies could not make a profit from the same or similarly designed products. I found the job opportunity for EnvirUP advertised on the NTU InPlace website. The application process entailed writing a cover letter and attaching it to my CV; I then sent this to the director of EnvirUP via email. As my application was successful I was invited to attend a one to one interview at the EnvirUP office. The NLS Employability department were extremely helpful when applying for work placements. I was able to apply for a number of job opportunities through the InPlace website. They also helped me secure my placement by reading my CV and cover letter, they suggested changes to enhance my application and conducted mock interviews with me. The department is also very accessible as they have drop in sessions so you can see them at a time that best suits you. During my placement I have developed a number of useful skills that with increase my graduate employability. For example, managing a high volume of tasks through prioritisation, effective research through distilling a large amount of information, enhancing my communication with both colleagues and clients and by combining these skills I am able to solve complex problems. It's also important to complete complex tasks in order and not to avoid doing them because they are difficult. My work placement will help me with my further studies because I learned how to research more efficiently, using a range of different sources, taking in key information and utilising it effectively. I have also improved on my organisational skills as I can now use a variety of methods such a timetabling and documenting. Most importantly I learned how to stay committed to a cause, especially when the tasks become particularly challenging. The advice I would give students applying for a work placement is to do so early and to apply to as many as possible. Don't be too disheartened if you are rejected by an employer, instead, use this as an opportunity to self-evaluate and understand where you can improve next time. When you are invited to an interview it is important to fully prepare, I often use cue cards leading up to an interview to list my skills, achievements and information about the company. After I complete my undergraduate course I plan to continue studying law at LPC level, after which I will obtain a training contract with a law firm to qualify as a solicitor, I would preferably like to work within the intellectual property law sector. 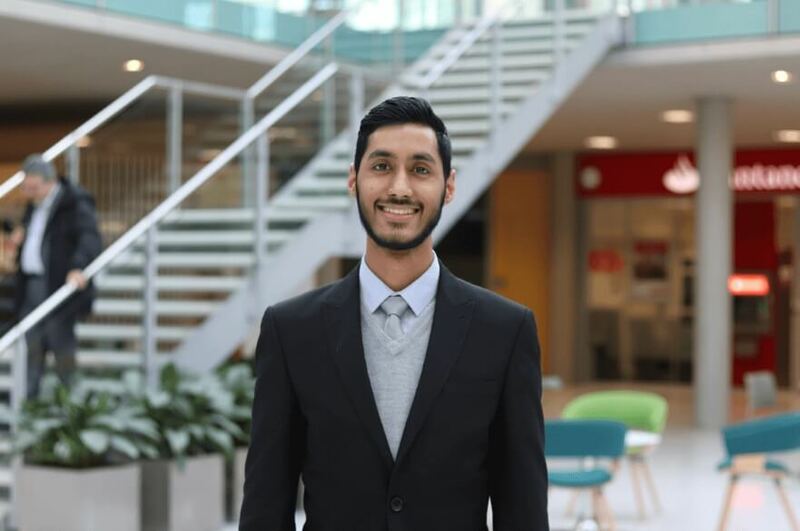 My favourite memory from my time at NTU was being part of the Islamic Society, I had the opportunity to meet many new people and I got involved in many exciting projects. I was then voted as the Treasurer of the society which allowed me to organise events for the society. The thing I enjoy most about living in Nottingham is the community; everyone is very welcoming and helpful! The city is full of life and you never find yourself with nothing to do. The city was very easy to navigate around too, especially because of the tram system, so it's hard to get lost. On top of that, my course itself (Law LLB) has very helpful staff. Everyone from the lecturers to the tutors ensured that all my questions were answered during my time studying here. They are very swift in responding back to you and they are very approachable.